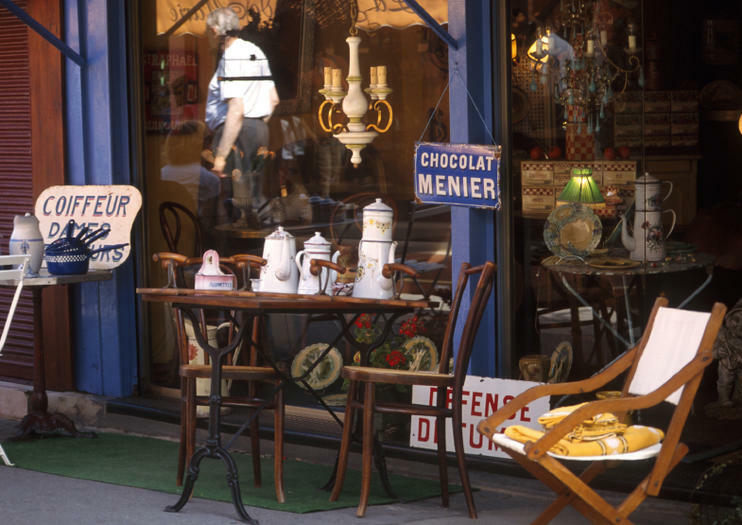 Among the world’s largest flea markets, the Marché aux Puces de Saint-Ouen is located just north of central Paris. Established in 1870, the popular shopping destination now comprises 15 different sub-markets, each of which specializes in different items. Prepare to spend hours browsing, bantering, and bargaining. One of France’s most popular tourist destinations, the colossal Marché aux Puces de Saint-Ouen is a veritable treasure trove for shoppers. Stretching across 22 acres (9 hectares) and home to roughly 3,000 traders and antique dealers, the flea market attracts upward of 180,000 shoppers each week. To help visitors navigate its vast expanse, the Marché aux Puces de Saint-Ouen is divided into 15 individual market areas, each with its own focus. For example, The Marché Paul Bert showcases high-end furniture and decorative items, and the Marché Vernaison comprises an array of bric-a-brac. Small-group and private walking tours through the Marché aux Puces de Saint-Ouen are available, and offer an accessible way to explore its expanse. Shoppers can also venture on independent bargain-hunting excursions. Shoppers can score discounts and special deals if they bargain with traders, but it helps to have some level of conversational French. Many vendors are closed on Monday or are only accessible via appointment; Saturday and Sunday are better general shopping days. The Rue des Rosiers is the main thoroughfare that connects numerous markets. Be aware of pickpockets, who can take advantage of the large crowds; avoid bringing unnecessary valuables with you. The Marché aux Puces de Saint-Ouen is located just north of the Périphérique. Take Metro Line 4 to Porte de Clignancourt or Line 13 to Garibaldi; the Gare de Saint-Ouen, served by the RER C, is also within commuting distance. Alternatively, take bus Nos. 56, 60, 85, 95, 137, 166, or 255. The Marché aux Puces de Saint-Ouen is generally open Saturday from 9am to 6pm, Sunday from 10am to 6pm, and Monday 11am to 5pm. Individual market times can vary, so it’s worth confirming opening hours in advance of your travels. If all that shopping has caused you to work up an appetite, venture to one of the popular nearby restaurants for a restorative meal. Ma Cocotte, designed by Philippe Starck, offers an elegant ambiance, while Chez Louisette is a classic and kitschy local bistro, complete with singing servers.